Born: As Susan Abigail Tomalin on October 4th, 1946 in New York City. 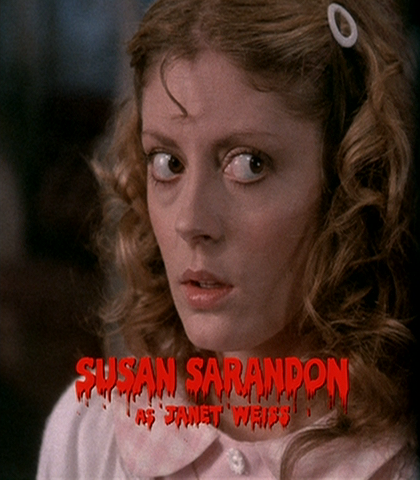 Academy Award winning actress Susan Sarandon was cast for the part of Janet Weiss in The Rocky Horror Picture Show (1975) as a relative unknown who had appeared in a few film and television roles beginning with Joe in 1970. An American actress was wanted for the role of Janet, and Tim Curry (who Susan Sarandon had met at the the Roxy Theater in Los Angeles) suggested that she audition. She had done no professional singing prior to this role, but was interested in the challenge. After Rocky Horror of course she would go on to extraordinary success as an actress with five Academy Award nominations, while also being noted for her social and political activism. Susan Sarandon has been in a relationship with actor Tim Robbins since meeting him on the set of Bull Durham in 1988. She was married to actor Chris Sarandon until 1979, and elected to keep her married name as her stage name.